Mrs Eleni Marianou is Greek and a multilingual lawyer specialising in International and Public law. She has extensive knowledge of European affairs and working practice in European organisations of local and regional authorities. She initially worked as Policy Officer at the Central Union of Greek Municipalities and Cities in Athens, then as Network Manager at the Council of European Municipalities and Regions in Paris, and finally as Policy Director at Eurocities in Brussels. Between 2001 and 2009 she managed the South West of England Brussels Office as its Director responsible for coordinating and ensuring the strategic development of the Region in Brussels and with public and private partners of the Region. Eleni Marianou has been active in European activity in Brussels for over 20 years. 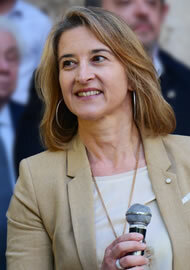 She is currently elected Secretary General of the Conference of Peripheral Maritime Regions of Europe, managing a team of 34 staff members based in Rennes, Barcelona and Brussels, with responsibility in advising and leading policy development and strategic leadership in the areas of territorial cohesion, European governance, regional competitiveness, maritime policy and sustainable development.